Glass ornaments are a very popular traditional Christmas decoration due to their classic and refined appearance. However, if you are concerned about the wear and tear or fragility of glass ornaments, shatterproof plastic ornaments may be just what you need. Shatterproof ornaments are carefully crafted to imitate the look and feel of glass as closely as possible. Except for a visible but understated seam that runs down one end, there is almost nothing in appearance to distinguish these from glass ornaments of the same shape. They come in multiple finishes, from matte, to shiny, to being covered in bright glitter. We carry them in multiple shapes and sizes, from ping pong ball-sized to over a foot across, or even in hanging forms which are multiple feet in length. Most of the time, Christmas ornaments are hung on the tree. However, just because this is the traditional use, doesn’t mean you have to be restricted to only using ornaments this way! With their generic-but-immediately-recognizable shape, Christmas ball ornaments have a great deal of versatility in what they can be matched with. A popular use for ornaments is to decorate bowls, dishes, and vases. A series of ornaments, usually all of the same color and finish, can fill the interior of these containers, giving a colorful accent to whatever place setting they are part of. Alternately, ornaments can be used as hanging decorations throughout the house. They could be strung with ribbon and put on the wall, perhaps running up the banister of a house’s stairs, or lining a wall in a specific pattern. They could also be tied into garland shapes with running thread or glued together to form a wreath. 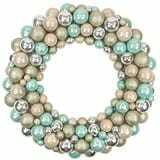 We offer pre-made ornament wreaths on our site, made of shatterproof ornaments in several colors and sizes. Ornaments could also be put together into specific shapes. You can use them to create towers, imitation flower displays (perhaps with artificial leaves interspersed in the grouping), or other sorts of hanging or standing decorations. These ideas are just scratching the surface. The wide variety of coloration, size, and finish leaves an endless amount of possibilities to take advantage of, so let your imagination run wild and your creativity flow! Decorating the interior of a house is much more than just setting up a Christmas tree. The average house has limitations as to where decorations can be placed without causing disruptions in daily life and taking up too much floor space. Therefore, it is crucial to determine what space is available in your house and how to work with it to make the best indoor display possible. The most common area to set up a decoration is on the mantelpiece of a fireplace. The mantel is most often decorated with an assortment of garland, lights, and stockings. Ribbons and candles are common as well. Set ribbon parallel to the edge of the shelf, and evenly space any standing items. It may also be interesting to string lights or extra greenery up and down the sides of the mantel, where it stands almost flush with the wall in most houses. And for a crowning touch, a large wreath that precisely fits the open wall space above the mantel makes a grand statement. Open side tables are a good place to set any small figurines, miniature village settings, and table accents. Be sure to select ones that complement one another. Consider framing your set piece with lights or garland, or lining the outside of the table. For dining tables, a cheerful centerpiece can really make a difference. We have several available, from small table swags to large candle lanterns. Consider whether you want a smaller one that can be left in place when the table is in use, or a large, removable setting. Lights are commonly strung up on mantels, banisters, railings, stairs, or even outlining a doorway. Keep in mind that lights will appear much brighter indoors due to the close quarters. It may be wise to steer clear of large bulbs or LED lights and opt for simple mini or micro lights instead. Have you finished decorating the inside of your home? Looking for more ways to show your Christmas spirit? Sure, you may have put a wreath on your door or hung some lights on your roof, but what about the rest of your yard? 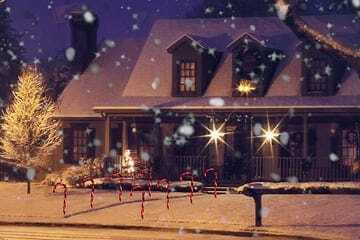 The outside of your home is a great opportunity to display a full Christmas scene. Here are some ideas of how you can turn your yard into a winter wonderland. Hanging lights from your gutters is great, but there’s no need to stop there! At Christmas Central, we have a number of different lights available to add some life to the outside of your home. Simply plug in and point a projector to immediately light up the side of your home. Additionally, you can write out a Christmas message with our versatile rope lights! Do you want to light up the walk up to your front door? A great way to outline your sidewalk or driveway, luminaries can add elegance, grace and style to any yard. Or instead of luminaries, you could use our tree yard decorations or other lights to outline the path to your home. Don’t overlook what you already have in your yard! Catch the eye of everyone in your neighborhood by adding lights and large ornaments to your trees. Branches and tree trunks can be adorned with lights and decorated much like the roof of a house or an indoor Christmas tree. Bushes and hedges can also benefit from net lights. You can spiral strings of lights around the circumference of your tree trunks, or use trunk lights to make the job even easier. You can also add decorations to other items in your yard like fences, lamp posts and handrails! It’s a good idea to have an electrical timer for your outdoor lights. After all, you put so much time and effort into hanging up your Christmas lights; it would be a shame to forget to turn them on! With a light timer, you can always be sure that your lights turn on at night, and are off during the day. Click here to read more great lighting tips. Of course, we can't forget about outdoor holiday decorations! They come in many shapes and varieties, from fun cartoon characters to your favorite Christmas decorations. Here are a few quick tips to consider with outdoor decorations. Do you have a theme that you’re following? Having a theme is an easy way to make sure that your decorations don’t clash. Nothing can disrupt the harmony of your scene like figures that just don't work together. For example, a large silly cartoon character wouldn't look so great placed next to a large nativity scene. You could choose a winter wonderland theme, wrapping your trees with lights and decorating your yard with snowmen and snowflakes. Another example could be Santa's workshop. With this, you could have Santa, reindeer, and even presents underneath one of your trees! The possibilities are endless. Since outdoor figurines tend to use a lot of space, it can be helpful to take measurements and plan your layout ahead of time. A cluttered yard is not a particularly attractive one, but this can be avoided with a little forethought. A great tip is to arrange your decorations to vary in size, using both larger and smaller figures to create the look you want. 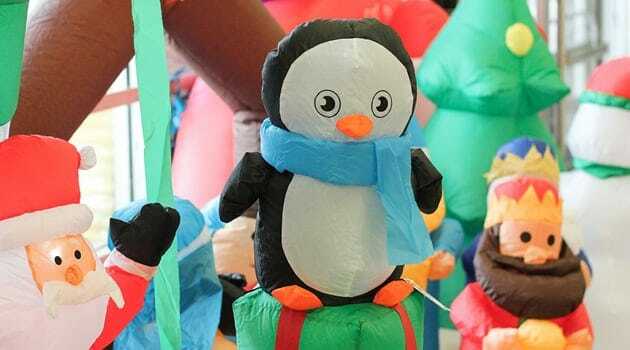 Inflatable outdoor decorations have become increasingly popular over the years. They are easily inflatable, deflatable, lightweight, and they come in a great variety of styles! Carefully unpack garland from the protective packaging. Place the garland on a flat surface and straighten to full length. Plug the light cord into a UL-approved extension cord, at least 6' long. Start from either end and randomly fan each branch toward the center and consistently toward one end. For the best look, shape the garland while lit. Do this to the entire garland to attain fullness. Hang the garland and adjust the foliage into its final arrangement. Wreaths from Christmas Central, on occasion, cause some confusion with customers, as they are shipped in a tightly-bound and packed state that makes them appear smaller than they actually are. 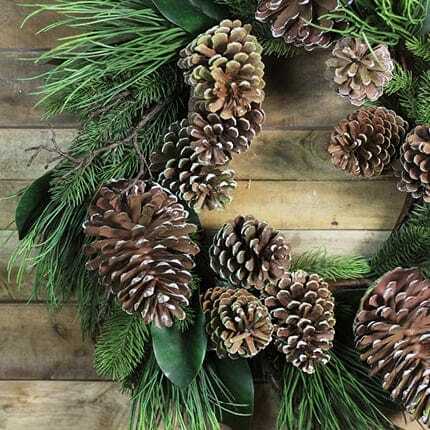 The wreaths need to be shaped, expanded, and fluffed out to reach their full measured size, which is determined by measuring from one end of the wreath to the other, tip to tip. Note also the depth of the wreath, which is measured from the base in the back to the very front. Carefully unpack the wreath and place on a flat surface. Plug the light cord into an UL approved extension cord, at least 6’ long. Plug the extension cord into any convenient standard floor or wall outlet, the best look will be achieved by shaping the wreath while lit. Form either hand into a claw or comb shape. 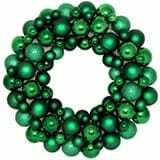 Hold the wreath ring and slowly move it in a circular direction as you draw your clawed hand through the branches, going against the grain. Apply this technique several times to attain a full look. Hang the wreath in the desired location and adjust the foliage into its final arrangement. Well, the holiday season is over. Christmas is done, and New Year’s has come and passed. By this point, you are probably looking to pack up the various Christmas decorations and store them for another year. The bags and boxes that Christmas Central offers are a good way to introduce a bit more of organization into the situation. Here are some quick tips on storing items. The main thing to keep in mind for wreaths is that they need to keep their shape. Therefore, they need to be stored in a container or box that will not put any pressure on the frame. Placing them on end is a bit unwieldy, and placing them flat is only okay if nothing else will be placed on top of them, which may be a hardship for storage space depending on the wreath size. Another possibility is storing the wreath in a bag to protect it from the elements, and then simply hanging it on the wall of your storage space. 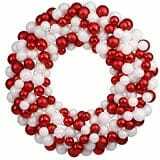 This takes up the least space and is also good for not overtly warping or changing the shape of the wreath. Christmas trees themselves are one of the trickiest items to store. Although many people try to keep the cardboard box the tree originally came in, cardboard isn’t the longest lasting of materials. The box is likely to slowly deteriorate, exposing the tree to the elements and anything else that might damage it. 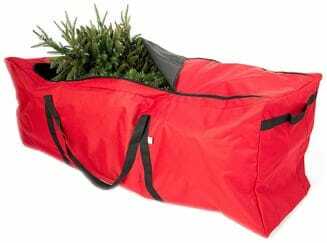 As an alternative, we offer heavy duty Christmas tree storage bags for sale that are much more durable and reliable. If your tree has hinged branches, you want to first compress the flared branches back into a narrow configuration and then fold them up, starting from the top, to get it into the thinnest possible shape to put away. Trees with removable branches should be stacked in storage with the largest branches on the bottom so as to make as much use of the space as possible. 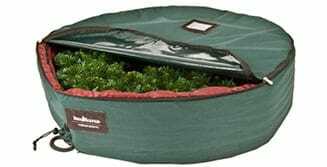 Finally, whether in box or bag, the tree should be laid flat in storage, rather than on its end, so as to not shift the materials inside too much. Flocked trees should not be stored in hot conditions as it may cause yellowing of the flocking. Ornaments and other small figurines should be stored in safe boxes. 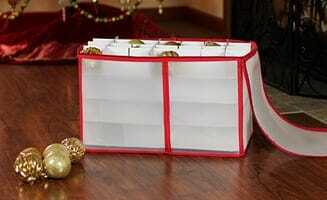 We have ornament boxes available for sale that allow them to be individually compartmentalized for maximum safety. If you do not wish to use one of these containers, there are other options. Use a box that is filled with shredded newspaper or other soft filler to keep the ornaments from colliding with each other. Also, make sure that you do not place any other boxes on top of this box as you don't want to risk buckling the sides and crushing your ornaments. Lights are a trickier subject when it comes to storage. Although they are relatively resilient and can be stored in very small containers, this leads to the inevitable massive tangle that they will become by the next time you attempt to retrieve them. The problem lies with the long thin wires. Being so flexible, even if they are hardly moved there will be some shifting, tangling, and repositioning. Unless they are stored properly, your lights will easily knot up. To make light storage easier, we have a few storage options available for you. Light reels & storage wraps are great effective tools to make sure that your lights stay organized and tangle free. Simple to use, either one of these tools can make organizing and storing lights a quick and easy task.